Let’s try a little experiment. I’m going to define some products that don’t exist. Slightly smaller than D3300 body. Rationale: the DSLR type of population is aging and really does want a smaller, lighter product. Preferably a metal alloy frame and structure with decent weather sealing. Rationale: the target user wants a high level of build quality. 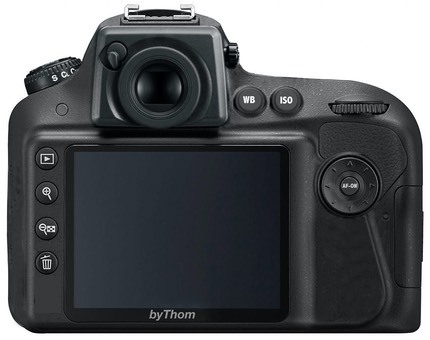 The body has front and rear command dials, a PASMC1C2 Mode “dial", a switch for shooting method, a switch/button for focus settings, plus dedicated exposure compensation, bracketing, ISO, image quality, and WB buttons. The buttons you can’t see are on top of the camera in the photo below. Rationale: put the basic things the user needs to control into controls! Keep the controls as Nikon-like as possible. Camera has useful WiFi built in. By useful I mean image connection to computers as well as mobile devices, plus a full remote setting/control via WiFi. All setup and customization is done via mobile device. Rationale: Wireless shouldn’t just be images sent to one type of device. F-mount. Rationale: let us use legacy lenses if we have them. Probably OVF, but EVF possible if done right and focus performance is DSLR-like. 24mp DX sensor, no AA filter. Rationale: DX is good enough, keeps the cost down, 24mp with no AA filter is right at the limits for getting good results in crop sensors, and it’s good enough for most prosumer users this camera is targeted at. EN-EL15 battery or something similar from the current Nikon lineup. Rationale: let’s not keep inventing batteries, and let’s use one with a long shooting life. No menus! That’s right, none: nothing to set via menu. If you really need to change some esoteric custom setting (of which there will be few), just do it from your smartphone or computer via WiFi. Rationale: this is a shooter’s camera, not a tinkerer’s camera. That said, we’ll have some custom settings, but they’ll be accessed via your mobile device, not a menu system. Everything you’d change while shooting is in a control, plus we’ve got a couple of Custom User settings on the Mode dial so that you can switch between your pre-programmed settings quickly. No video. No HDMI out, no anything out or in except perhaps a USB connector in the battery chamber as backup to the WiFi if you can’t get it running properly or don’t have Wifi. Rationale: simplifying the body with fewer connectors allows for better weather sealing. Cost: US$1000 body only, US$1500 kit (16-40mm f/4 VR). Rationale: we’re targeting the prosumer. If you think you need the menus for something, such as formatting a card in the camera (I’m assuming SD cards here due to the small size of the body), assume that this is taken care of some way. For example, Nikon themselves provide formatting by pressing two marked buttons simultaneously, so this camera would have that as well as a two-button reset. Prime set: 16mm f/2, 18mm f/2, 24mm f/2, 35mm f/2, 58mm f/2, all in the US$400-600 range. Rationale: cover 24-85mm prime range with small, reasonably fast lenses. Zoom set: 10-20mm f/4, 16-50mm f/4 VR, 50-135mm f/4 VR, all in the US$600-1000 range. Rationale: cover 15-200mm zoom range in three small, competent lenses. All lenses designed for minimum size and weight, but weather sealed and high image quality (defects also corrected via software in camera). All are AF-S DX. Okay, got all that? Now please click the following link to take a short survey and tell me what you think. Note to non-Nikon users: you Canon, Pentax, and Sony shooters can just imagine the relevant changes to make this work for your brand when answering the survey. Canon uses a different button and dial system than Nikon, for example, but that doesn’t preclude making a menu-less camera nearly identical to what I describe here.